(Updated at 11:50 a.m.) Those who live and work along Columbia Pike will have to wait another year for the implementation of a “Premium Transit Network” along the corridor. Arlington’s Dept. of Environmental Services issued the following statement on the delay. Originally proposed for summer 2018, implementation of the Columbia Pike Premium Transit Network is now planned for summer 2019. Much of the new service for this network depends on Metrobus, but Metrobus service improvements have been hampered by Metro’s SafeTrack program and the need for Metrobus to focus efforts on moving passengers around rail disruptions. The County is still working to improve local ART service on the original schedule, and we’ve started the purchase process for new buses needed for future service improvements. Arlington’s Transit Bureau is working with WMATA and Fairfax County to develop an implementation plan for Columbia Pike service improvements. Metrobus has executed a contract to begin the planning and combine improvements included in both Arlington and Fairfax County’s Transit Development Plans. The Premium Transit Network was criticized as not ambitious enough when it was approved last year, especially compared to the Columbia Pike streetcar plan it essentially replaced. County staff was directed to consider other enhancements to transit along the corridor to supplement it. 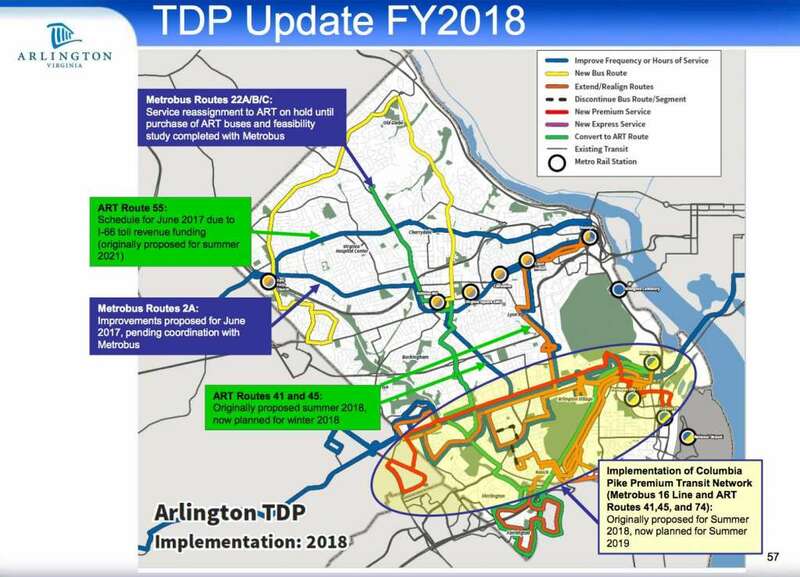 Although the transit network implementation has been delayed, Arlington County and WMATA have already implemented a number of planned enhancements to bus service along Columbia Pike and elsewhere in Arlington, according to slides from a Dept. of Environmental Services budget presentation that were posted online.